Whilst in the Courtauld Gallery earlier this week to see the Peter Lanyon exhibition I had a look at the permanent collection and spent some time wondering at the landscape background in an early sixteenth century painting by L'Ortolano, Woman taken in adultery. Instead of a simple grass bank behind the figures, there is a blur of green in which leaves seem to float like seaweed. To the left, deep blue rocks frame what appears to be a fast flowing river, looking as if it had been photographed with a long exposure. 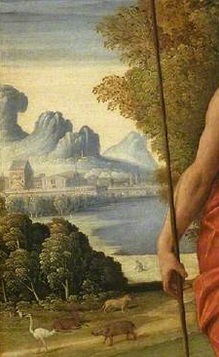 There is another painting attributed to L'Ortolano down the road at the National Gallery (below) in which these effects are less marked, but where areas of grass and rock, painted in short Renoirish strokes, bear some resemblance to the surface of water. 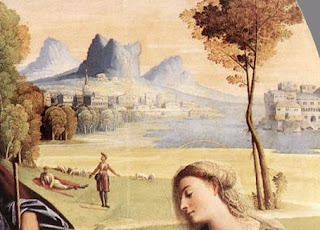 that 'as in so many Ferrarese paintings, the landscape is enchanting, with its mountains "rising like teeth from the plain," as they were once described.' There is a disquieting contrast between the pastoral middle ground and those strange storm-cloud like forms rising from the land beyond the water. 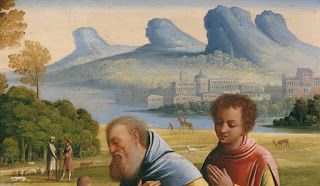 Some more of these billowing mountains can be seen in the Fitzwilliam's St John the Baptist (right) and the Galleria Doria Pamphilj's Nativity with Saints. In these too they contrast with serene, sunlit scenes just behind the main figures. At this time painters in Ferrara such as L'Ortolano, Garofalo and Mazzolino seem to have come under the influence of Northern landscape painting. You find rock formations rearing above the landscape in paintings by Joachim Patinir, but they usually resemble shards of ice or crystals. L'Ortolano's look as if they have surged briefly into life and could soon blow away, like a summer storm. So it seems I have now been writing this blog for exactly ten years. If I had considered this when I started and realised it was going to have more than one or two actual readers, I might have come up with a better name for it... I recall being too eager to get down to it to think beyond the idea that it would be about 'some landscapes'. That first post in November 2005 was about two works by Richard Long and Hamish Fulton combining sound, text and art - three ways of addressing landscape through culture that I have continued to write about ever since. All the subsequent posts are still available on my clickbait-free sidebar, or they can be accessed through the index (itself now nearly 20,000 words long) or through the Google maps I recently added. However, rather than look back on what I have covered over the years, I thought it might be good here to celebrate other people's blogs that I have particularly enjoyed, with a few autumnal images and quotes thrown in. Both myself and Mrs Plinius are great admirers of the writings of Ken Worpole. The blog he started with Jason Orton, The New English Landscape, contains short essays on some of the themes I have covered on this site. British writing, music and film have all been covered in recent years on Landscapism, which I hope Eddie manages to keep going while he pursues his academic studies. Similar ground has been covered by the collective blog Caught by the River, for which many of those I am talking about here have written short pieces. Collaborative sites can be as transitory as personal ones, but this one, with its publications, social events and festival appearances, looks like it will become a long-lived and well-loved British institution. Another excellent blog with many authors is hosted by The Wordsworth Trust. It's focus is on Romanticism broadly, not just Wordsworth - I have a post on Robert Southey's 'The Cataract of Lodore' coming up on it soon. Some of the earlier literary blogs posted diary entries of great authors - you can for example read what Henry David Thoreau had to say about cranberries on this day in 1853. The John Clare Weblog started over a year before mine and reached its 1000th post sometime ago. Each entry contains a poem or text, often linked to the changing seasons. From November 2005 here is the first stanza of one of Clare's autumn poems which seems particularly apt in a week of such blustery weather. Red clouds mirrored where the waters meet. the encircling plains, mosaic of river isles. as autumn's last yellows fade. 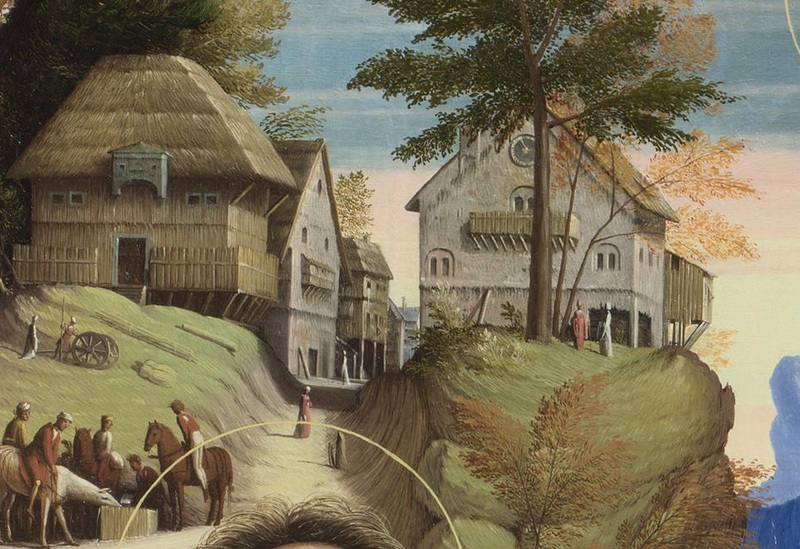 Sadly, over all these years, I have never found any other blogs devoted to the history of landscape art. I had hoped that the Internet's 'long tail' might have given rise to blogs devoted to the art of Cézanne or Balke or Altdorfer, to the Nanjing School or Aeropittura or early seventeenth century copper plate landscapes... perhaps they do exist and I've failed to come across them. For garden history I always used to enjoy Gardenhistorygirl - silent since 2014 - but the Garden Visit site's blog continues and it sometimes discusses interesting historical questions (e.g. on whether Zen gardens really were 'Zen'). I like the way its latest post begins: 'hard to know what I would write if the Sunday Express asked me to do a few hundred words on garden design but I can put some helpful advice in one sentence: 'don’t take advice from Alan Titchmarsh''. No doubt someone has already written an academic study of blogging's role in art practice. Chris Drury has used microcosm and macrocosm to document three of his projects, but it has been dormant since 2012. He is one of the artists whose progress I follow through Peter Foolen's blog, a reliable source of intelligence on upcoming exhibitions by people like herman de vries, Roger Ackling, Ian Hamilton Finlay, Alec Finlay and the artists wrote about ten years ago today, Hamish Fulton and Richard Long. Alec Finlay's own blogspot site is probably no longer the optimal means of keeping up with his activities but, like Chris Drury, he has used blogger to chart the progress of certain projects. Five years ago I wrote about The Road North, in which he and Ken Cockburn mapped Basho's famous journey onto the geography of Scotland. Station 47 was their temple of Zenshoji, Stonypath, the garden created by Alec's parents. In this post Alec quoted an autumn poem by Basho (the translation is by Cid Corman). Music and sound art blogs have come and gone - the useful Field Reporter site for example seems to have become inactive a year ago. It looked for a while as if Alex Ross would stop writing The Rest is Noise but he is still at it (I quoted him in a recent post about Mahler). His latest post is about a 'mobile opera' performed out in the landscape, Hopscotch. Some of the composers I have featured in my end-of-year landscape music surveys have kept blogs. The Land Observations site documents the work of James Brooks which I first mentioned here in 2012. 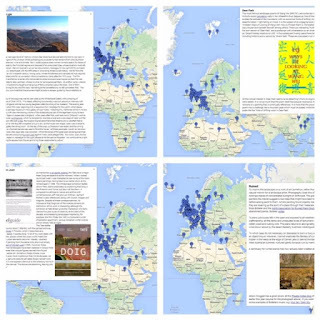 Jez riley French has a blog for his field recordings but also another one, treasure hiding, that is more of an online notebook featuring art and photography as well as music. Richard Skelton has one blog under his own name one for his Landings project. The Corbel Stone Press which Richard runs with Autumn Richardson has its own elegant Wordpress blog - newest posts concern the latest edition of their journal Reliquiae. (I will shortly be editing the first Reliquiae Digital Supplement in collaboration with flowerville, whose own blog engages with an intriguing range of writers). 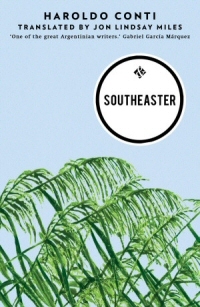 There is an 'Afterword' by John King, whose excellent Modern Latin American Fiction: A Survey I read avidly at university when it seemed as if all the most interesting writers were from South America. Three of the novels I enjoyed back then, Love in the Time of Cholera, The General In His Labyrith (both by García Márquez) and The Green House (Vargas Llosa) concerned river journeys but they were very different to Southeaster, with its slow pace, muted imagery and precise descriptions of fishing and navigation. King mentions other pre-Boom writers admired by Conti for whom landscape was important: the Uruguayans Juan José Morosoli and Juan Carlos Onetti, the Brazilian João Guimarães Rosa, and the poet most associated with the Paraná river, Juan L. Ortiz. He also draws parallels with Domingo Faustino Sarmiento, the nineteenth century president of Argentina in whose political writings the river was a central theme. Conti lived near Sarmiento's old home and both their houses have now become museums. Politics only featured in Conti's last novel, Mascaro, the American Hunter, published in 1975. A year later a new military regime came to power and Conti became one of the disappeared. 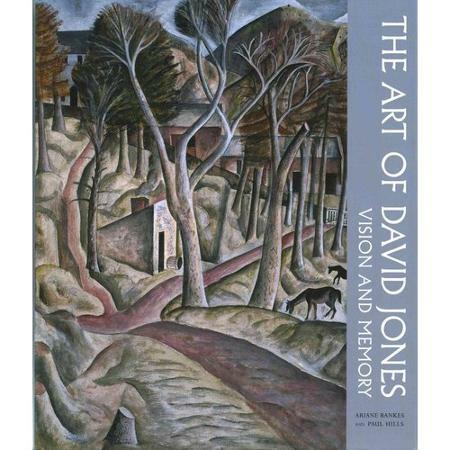 We went down to Chichester last weekend to see the Pallant House David Jones exhibition. I have written here before about Jones' book The Anathemata but not previously described his paintings, which are discussed in the excellent catalogue by Ariane Bankes and Paul Hills. Landscape became a central concern for Jones in the late 1920s when he lived with Eric Gill's family at Capel-y-ffin (shown above on the cover of the book). After his turn to writing and breakdown in 1932 there are fewer landscapes and these mainly views from windows ("I like looking out on the world from a reasonably sheltered position"). Finally, after the war, there are his tree paintings - simples studies to begin with and then, in 1947-8, the complex multi-layered symbolic vision Vexilla Regis which now hangs at Kettle's Yard, the home of his friend Jim Ede. I like what it says of Jones on the Poetry Foundation website: 'he spent the last years of his life quietly working, trying to salvage the remnants of traditional Western culture from the onslaught of the twentieth century'. Paul Hills suggests that Jones' art, which became unfashionable when 'any whiff of the literary or the illustrative in painting was suspect', may find a new audience in a world where major figures like Sebald, Twombly and Keifer are revered for their interweaving of personal memory, history and myth. 'The little islands of grass do not ripple. The trees in the background do not ripple: it's just the boggy-looking dried earth that ripples and then, gradually, stops rippling. 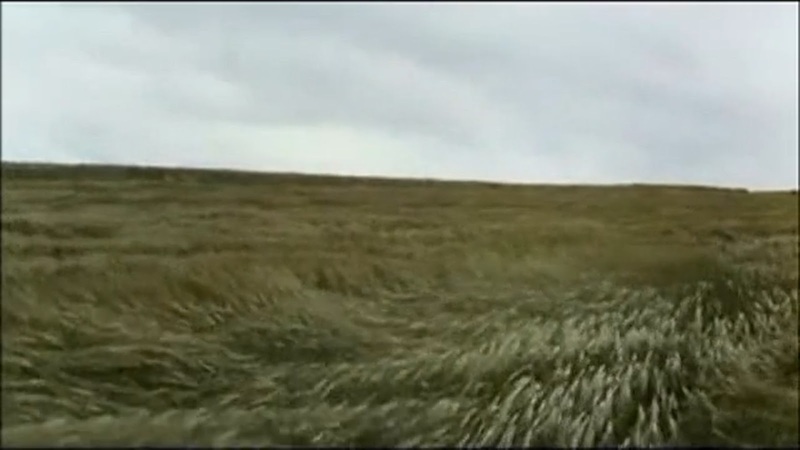 How does Tarkovsky do this, how does he achieve these effects? Or are they not effects? Was it simply luck that he came across a patch of ripply quicksand and then it started snowing where, a few seconds earlier, it had been dusting and blossoming? 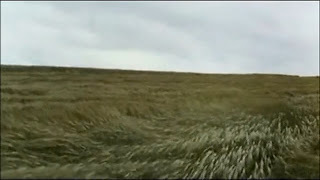 Is this part of the random magic of cinema that Herzog discovered in a sequence of footage shot by Timothy (Grizzly Man) Treadwell? 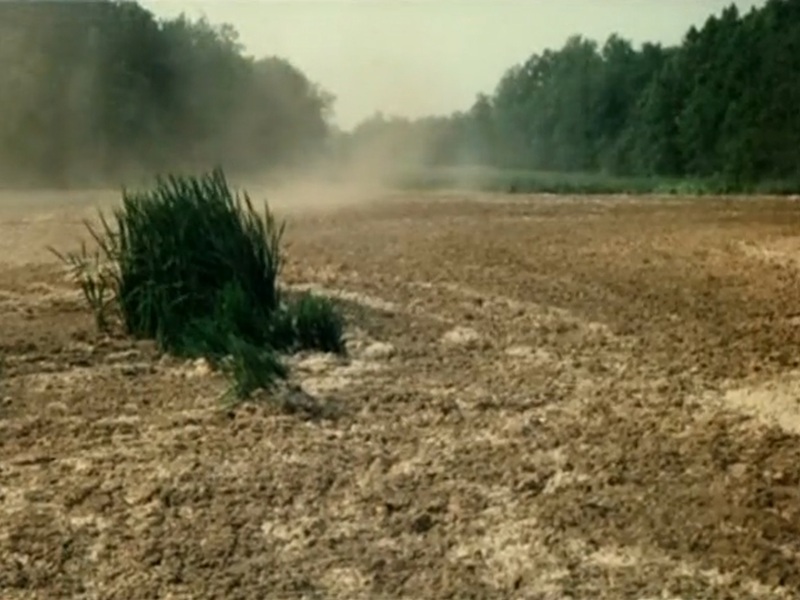 Treadwell plunges into and then out of shot, leaving the camera to record only the wind-whipped bushes and foliage. 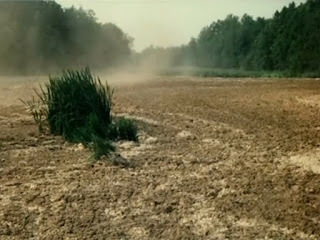 'In his action-movie mode Treadwell probably did not realise that seemingly empty moments have a strange beauty,' Herzog explains as the bushes and trees bend and sway in the wind as if in unconscious homage to Tarkovsky*.